The Veil Nebula, left behind by the explosion of a massive star thousands of years ago, is one of the largest and most spectacular supernova remnants in the sky. This is only a small section of it. 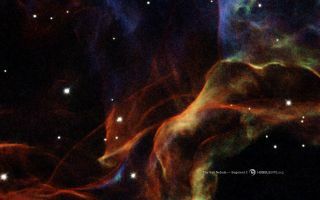 In this cool space wallpaper, the Veil Nebula, left behind by the explosion of a massive star thousands of years ago, is one of the largest and most spectacular supernova remnants in the sky. This is only a small section of it.